Kiel Waterworks provides over 200 million gallons of water to our residents each year. Our main priorities include providing safe drinking water to our residents and protecting this vital natural resource. We routinely monitor the City's drinking water according to Federal and State regulations. Our goal is to provide you with safe and dependable drinking water. We are frequently in contact with the Wisconsin DNR in order to ensure the quality of your drinking water. 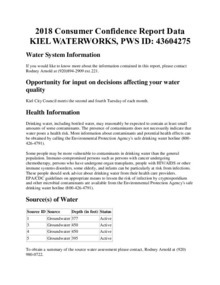 To view the most recent Water Quality Report, click here, or view the document posted below. This report provides detailed information regarding the quality of your drinking water supply during the past year. This summer, as part of the City's Lead lateral Replacement Program, the City of Kiel Water Utility will replace lead laterals on the 700, 800, and 900 blocks of Fourth Street, and the 400 block of St. Paul Street. Beginning in April, northbound traffic on Fourth Street will be required to detour to Third Street. All intersections will remain open, but no traffic will be allowed to travel north on Fourth Street between Paine and North. Southbound traffic will be able to travel on Fourth Street as usual. Please view the map posted for clarification. (920) 894-2909 ext. 102 or email Kris.August@kielwi.gov. Download "Fouth Street Detour Map.pdf"
If you would like to have your drinking water tested for lead, the WDNR compiles this list of certified lead testing facilities in Wisconsin. 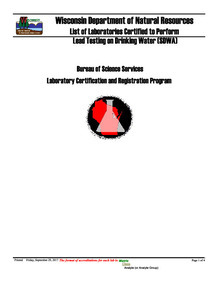 Download "Certified Labs for Lead Testing.pdf"